Published: Oct. 22, 2012 at 10:27 a.m. 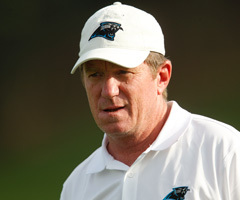 Updated: Oct. 22, 2012 at 04:23 p.m.
Carolina Panthers general manager Marty Hurney hired coach Ron Rivera before the 2011 season. Hurney now has been shown the door. While Rivera hasn't had long to get his feet wet as an NFL head coach, his job security suddenly looks to be in danger. There will be a new decision-maker in Carolina before next season. New decision-makers almost always want to bring in their own hand-picked coach. It didn't take long for speculation to start that Panthers owner Jerry Richardson could look to a coach who would have enough sway bring in his own hand-picked GM. The analysts on "NFL AM" immediately began to talk about Bill Cowher as a potential coaching candidate in Carolina. It's not fair to Rivera, but it's a natural connection considering Cowher's ties to the area. (He lives in Raleigh, N.C.) In case you're just tuning in, work life in the NFL isn't about "fair." Rivera is 7-15 in two seasons. He's a defensive coach who has struggled to improve the Panthers' defense. Whether or not Cowher is interested in the job is almost irrelevant. Rivera and offensive coordinator Rob Chudzinski have 10 games at most to show they are the right men to lead Cam Newton and this franchise. Richardson showed Monday that he's ready to make big changes. Rivera will have a new boss or he'll be fired. He's coaching for his job the rest of this season.